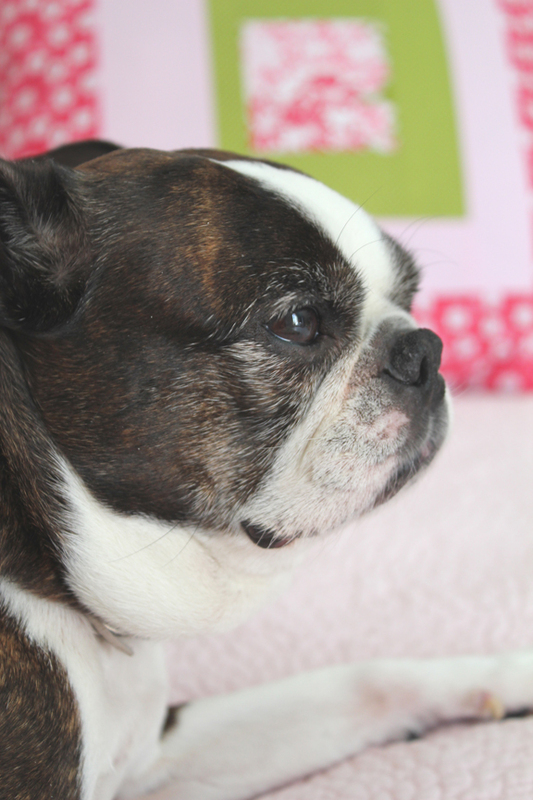 olive and ollie: my first project for Riley Blake's Design Team and a giveaway! my first project for Riley Blake's Design Team and a giveaway! 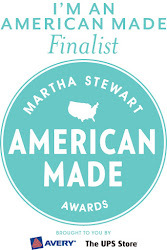 Today I am sharing my first project as part of the Riley Blake Design Team! 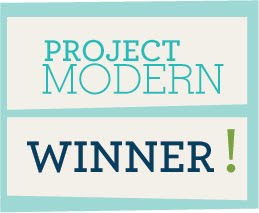 I am so excited about being a member of this amazing team of designers, and for my first project, I made a Modern Log Cabin pillow cover with an envelope closure using some of Carina Gardner's beautiful Dainty Blossom fabrics. The front is a modern spin on the traditional log cabin quilting block, and with it's clean lines and simple construction, this pillow cover is easy enough for a beginner and a quick project for an experienced sewist. The envelope closure makes it easy to change out the pillow cover whenever you want, plus it's machine washable, which is a must if you have small children and pets like I do! Make a few of these out of your favorite fabrics for a fast and simple way to bring color to any space in your home! The tutorial with step-by-step instructions is posted on Riley Blake's blog, so please go check it out. I've also made a downloadable PDF of the pattern, which is available here as a google doc. 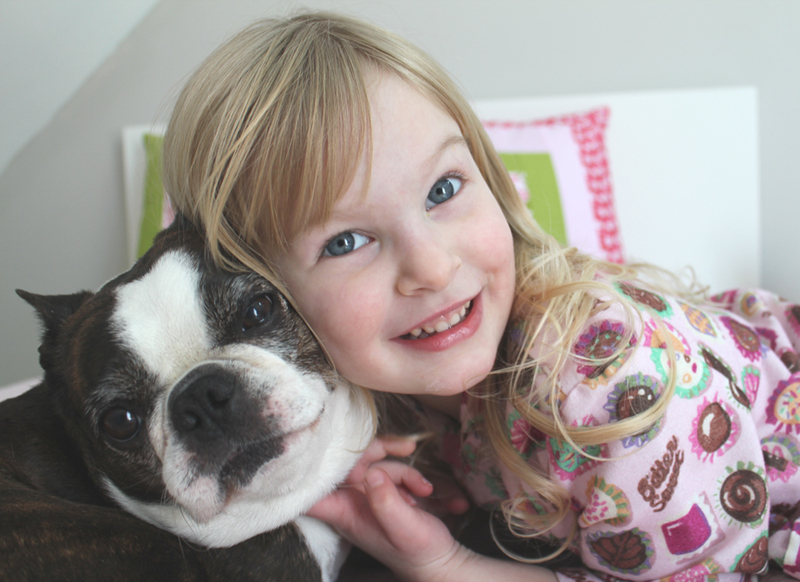 And speaking of pets and small children, they always make photo shoots...shall we say... interesting. Or challenging? But certainly more fun, nonetheless. Aren't my little helpers cute??? And now, on to the giveaway! Riley Blake is generously offering one lucky ready of my blog a fat quarter set of Dainty Blossoms! **Leave a comment telling me telling me what you'd like to make with Dainty Blossoms if you are the winner. ** Followers of my blog will receive an additional entry. If you're a follower of my blog, please leave a second comment telling me that you are. New followers are welcome, as well! That's it! The giveaway runs until March 7th, 2012 at 10 pm, EST. I'll use the Random Number Generator to pick one winner, and please be sure that your email address is either in your comment or a part of your blogger profile. I'll announce the winner here and then notify you by email. International entries are welcome. Good luck! I make quilts for Aussie soldiers in Afghanistan - there are girly soldiers too and i am sure one of them would love a girly quilt! Thanks for the chance to win - and p.s. I think your helpers are pretty cute! I am clearly seing a quilt for a little girl who will turn 4 in April! This is a lovely collection. I would make a gift quilt for the weddings that are inevitable in my family (nieces & nephews are in their early 20s!!) - just want to be prepared!! I have several nieces, all of whom are waiting patiently for quilts! Definitely would use this for that purpose! I love, love, love this fabric...love Riley Blake fabric...so fresh and pretty. Your helpers are very cute. I have been your follower for a while now...love seeing your beautiful posts. Such cute pillows, good job! I would definitely make something matching for my nieces - no idea what though! I would use this bundle to make my granddaughter a quilt. She turns a year old tomorrow and I love making things for her...or maybe a couple of pillowcase dresses...hmmm not sure. I'd like to make that very pillow you did. I love it. I'm following you in my new reader........bloglovin. These fabrics sing crib quilt to me. I follow your blog via Google reader. Thanks for offering a fun giveaway. I'd like to try sewing a skirt for one of my girls (or both with all that fabric!). I've been quilting and making small sewing projects for a while now -- time to try clothes! I've been following your blog for a while now - love it! I'd make a quilt for our exchange student from China. Something to remember us by. Hello...pillows, of course! lol thanks for the chance! I know a little girl who loves pink and this bundle looks like it would fit the bill. Thanks for the chance. And, I am a follower. 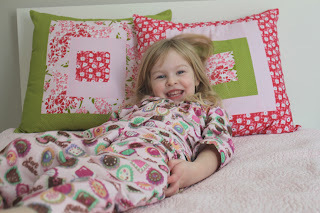 I have a baby girl quilt to make in the very near future... this would be perfect! Thanks for the chance! That yummy fabric says it wants to become summer patchwork twirllie skirts for my grandgirlies! Great first project, Heather. Ohhh! So beautiful! I'd make a quilt for baby girl who is coming in May...and maybe a few baby dresses! So fun! Congratulations Heather on all of your success in the past year! I've enjoyed following your journey! 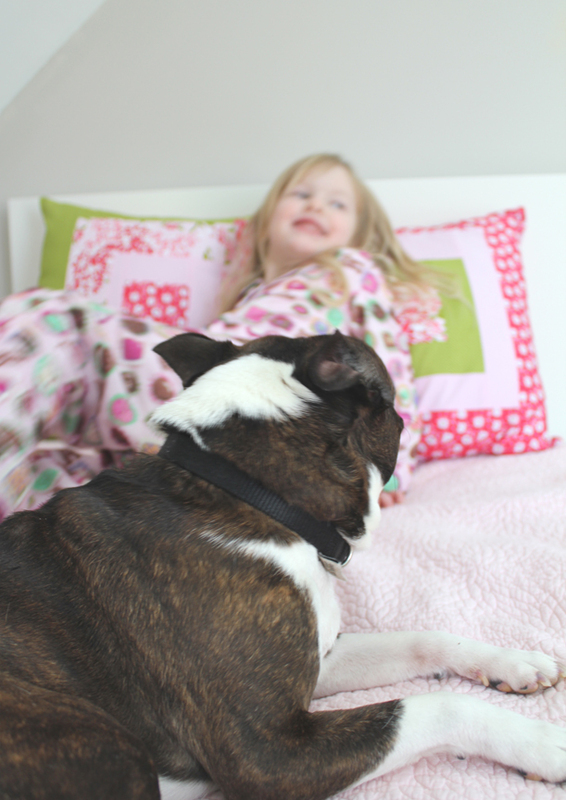 Your pillows are cute, and your helpers are downright adorable! If I won that FQ pack, I'd try to make the biggest quilt possible with it, so I could enjoy all it's goodness. What a happy collection! I'd use this fabric in my Granny Square quilt. I am a follower...thank you for the great giveaway! I think this would make a darling little quilt for my niece. Still waiting to make her one...looking for the right pattern to suit her. I would like to make a quilt for one of my nieces! I think I would make a quilt. I think if I won it I would want to share it with Jan-Maree for the Aussie soldiers (as per comment 1). I have a son and daughter in law in the military so it is close to my heart. My DIL is on a posting in the Middle East at the moment. I am a follower. And I love the fabrics you have used in your project. Love the pillows--and your always-beautiful photos too! If I won the fat quarters, I would use some for a wall hanging I have planned and others for quilts. 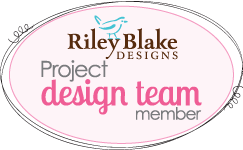 Congrats on being on the Riley Blake design team! I think I'd make a patchwork skirt! Maybe a couple of them!!! I love the pillows you made, they're so cute! I am one of your followers and am thoroughly enjoying your blog! Thanks for the giveaway! I would love to make a skirt or a dress for my daughter. I've been trying to find the perfect fabric for making some clothes, and I really love the patterns in this collection. Though I really love making quilts so perhaps that would be more likely to happen! Perhaps a pillowcase to go with it? Thanks again! Well - it looks like it would be enough fabric to incorporate most of it into a quilt, but to put some aside to make a dress for my daughter! Thanks for the chance to win! I'd definitely make a summery quilt -- so ready for warm weather! I think it would make a lovely baby quilt, and there seems to be tons of people I know having babies lately. Oooo - that looks like a gorgeous bundle! I'd make a quilt! I would make a pinwheel quilt. I'm new to sewing and I think it would be a great project for someone like me. Congrats on your first project! I love it! If I win I think I'll use it to make a quilt for a charity project I'm working on - quilts for kids in the hospitals. A little girl would probably love this! And I would make an awesomely girly quilt with this beautiful fabric! I subscribe via Google Reader to your site, but just signed up also via email. Thanks for the chance to win! I think these fabrics would be lovely to make a quilt for my "girly-girl" niece. I am now a follower to your fun blog. Thank you for this great giveaway. Have a great day. 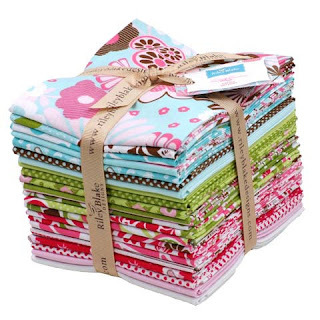 Dainty Flowers is perfect fabric for a fun summery girly quilt, no doubt about it. Love the fabric! Thank you for this great giveaway. Love your blog and the pillows are so fun, bright and cheery. Love them. I like the pillows and would probably make those! I'm also a follower of your blog! Love it! Congrats on joining Riley Blake! I am a huge Riley Blake fan and I love the fabric you used in your pillows. What a beautiful bundle of fun! I'm making dolls right now for the children's hospital and these prints would be perfect for the bodies and shoes. Beautiful fabrics! I'd make a quilt and be sure and save a little of this fabric to make matching pillows! NEW FOLLOWER+HAPPY TO BE !!! LOVE this line! Perfect for decorating my daughters room - a window valance, pillows, and some fabric baskets. THANKS for the chance! I'd make two little wall-hangings for a friends darling twin little girls that were just born last week. Thank you for the give away chance. I am a follower-- and I would make some lunchbags with those vibrant fat quarters! pFabulous FQ's, I use them to make a new project to show off in our new modern quilt guild! I'm a following on email. Thanks for the opportunity! Love your fresh ideas! I am hoping to jump on the Swoon bandwagon... these sweet prints would be perfect! And there would be fabric leftover for a scrappy quilt for a special baby girl! Please please pick me! Aaaaaand, I follow the blog, too! I'd make some pillows, of course! I love that fabric. I would love to design a sweet baby quilt or an awesome dress for a little girl. I would probably use them to make a lap quilt for my sister. I would love to make a quilt with that pretty fabric. Those prints would look great in one of those layered ruffle skirts for my girls. Any leftovers would be sure to end up in a quilt some day! I am a follower of your blog. At least I think I am. I read it through my Google newsreader - does that count? SOOO fun! I'd totally be making a quilt for my niece! Or maybe for myself...(hmmm) Thanks for the giveaway! Love the pillows! I am a NEW follower!!!! Hether - your pillows are wonderful! What a great touch they would add to a bedroom!! I would make a lap quilt from this beautiful fabric. I just love the colors in this bundle. I am a very happy follower of your blog. Thanks for the extra chance to win! If I were the lucky winner those fq's would go into a baby quilt or two. Thanks for the giveaway, you are going to make someone very happy! Oooo...I might try to make my first modern quilt!! 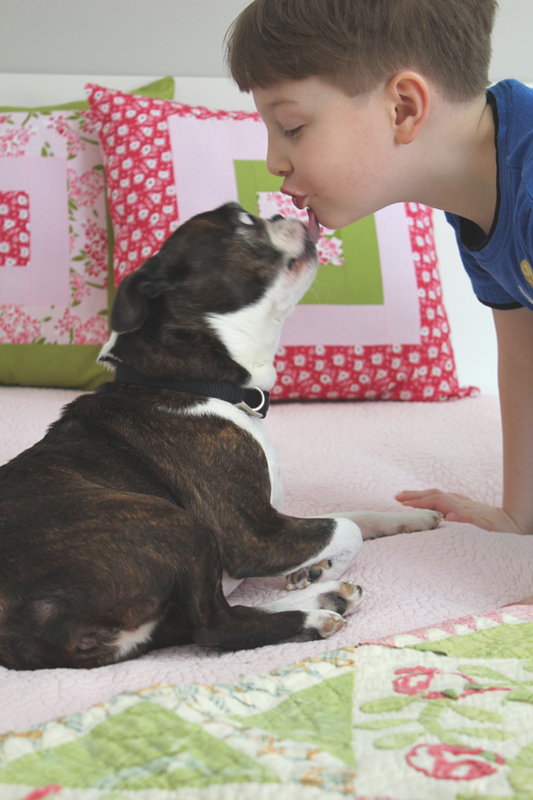 I love the pic of your son & pup kissing! So cute! What a beautiful FQ pack. Thanks for the chance to win! I would make cosmetic cases for my daughter's friends' birthday gifts with the bundle. I would probably make a small twin size quilt with it, and add a few pieces of my own stash to match. Thanks for the giveaway. I make a lot of quilts. But I think I would like to make some doll quilts for my little neighbor girls. This looks like a good fabric for that. I am a follower. Happy Leap Day! Adorable! Both kids and dog. Ooo if I would be so lucky to win, I'd made a double wedding ring quilt! I've been wanting to make one and this fabric would be just perfect! My friend is having a baby soon and it's a girl, so I will make baby quilt. Thanks for chance to win. And I am follower all ready. I'm a follower of tour blog ! I am a new follower. Thanks for the extra chance to win. I would make a quilt for my sister using the Amanda Murphy pattern -- Garden Jewels. Your helpers are so cute! I follow your blog through Google Reader/RSS feed. If I was lucky enough to win, I'd make a quilt for a great-niece. Thanks for the giveaway. I'd make a shopping tote. Those fabrics would be perfect for a pattern of an owl buddy I found. The owl is only about 10" high and is so cute for the kids. With the Riley Blake colors the girls would love these. Thank you for the chance to win. I'd love to make an owl quilt for my daughter who is in love w/ owls! Looks like a project for one of my nieces! Thanks. Yes I already subscribe through a reader. Thanks again! Your helpers are cutie pies, all 3 of them! I would use the fabric to make one or more lapquilts for grandnieces, depending on the design I settle on. I would make a quilt out of it for my granddaughter. Cute Puppy!! Thanks for the chance to win! I would love to make something for my daughter with this! Maybe some pillow cases! Great project! I'm a follower! Thanks for the giveaway! I'd love to make a girly quilt! Great giveaway, love the pillows! I think these fabrics would make a sweet baby quilt. Congrats on your first Riley Blake design! The pillows are adorable! I would love to make a baby quilt with these. They are absolutely precious. Congratulations! I am a follower! I would make some spring placemats! Love the colors! Gorgeous fabrics, I'd love to be able to have a play with them! I would make some pillows for our guest room... my son, daughter-in-law and my twin grandsons would love the bright colors. Thanks so much. These colors look perfect for my niece. Perhaps a flouncy skirt. I follow olive and ollie. I'm seeing a child's quilt in the near future. Those would make a fabulous quilt for my guest room. It's so 'blah' right now. Those prints are just the ticket to inspire me to redecorate. Thanks for the chance to win. Congrats on being a part of Riley Blake's design team :) I would split the bundle up and use the reds and blues in a quilt I'm planning for my older daughter, and use the other colors in a quilt I'm planning for my younger daughter. Their birthdays are this summer, so I still have time to gather fabrics. Thank you for the chance to win! I see sweet little patchwork curtains for a little girl. I really like those pillows. And I have to chuckle at your helpers, especially the furry one. My kiddos have a way of getting into my shots too. If I am lucky enough to win I'd use it for a quilt for a friend's daughter. She is an only child and very lonely. Because of her mom's schedule she spends a lot of time wiht her grandma. I do follow your blog! Thanks for the chance to win! I would use the fabric to make a quilt for my niece...she has special needs and is totally into spring colors! I would make give away baby quilts. There is always a baby out there that needs a quilt! I owe a grandniece a baby quilt - this would be a nice bundle to make something special for Emmie. She is a happy, good baby - chubby with giant blue blue eyes. This fabric would be stunning in a cathedral window quilt. I've wanted to make one of those for awhile... maybe I better start with a pillow lol. I think I'd make a cute multi-layered dress or top with pants to match. The pants might even have a wide ruffle on the bottom for added pizzaz. Finish it off with a headscarf or headband and any young girl would be steppin' proud. I just became a follower via e-mail. Can't wait for future inspiration! I love those pillows!! And your daughter and pup are adorable, love that picture. I think I'd make an apron for my daughter. finally following your blog. I follow you on twitter. Congrats on your first project on the design team, beautiful pillows! I would make a quilt for one of my granddaughters with that beautiful bundle! I am a follower, thanks again! I would make a dainty quilt! Pretty colors. I am a follower of Olive and Ollie and I would make my 2 yr old granddaughter some clothes with this line. Would that not be the cutiest little one?